This is pretty interesting indication of how recent our idea of “privacy rights” are. Apparently people were so curious as to what others were saying on the phone line that they would tap into them and listen in. This caused the voltage to drop and the signal to degrade. The solution? Add pre-installed, high-quality phones where they could “officially” listen in. TELEPHONE companies are much concerned by eavesdropping on rural party lines because it interferes with transmission over the line. To take down the receiver increases the electrical resistance of the circuit. 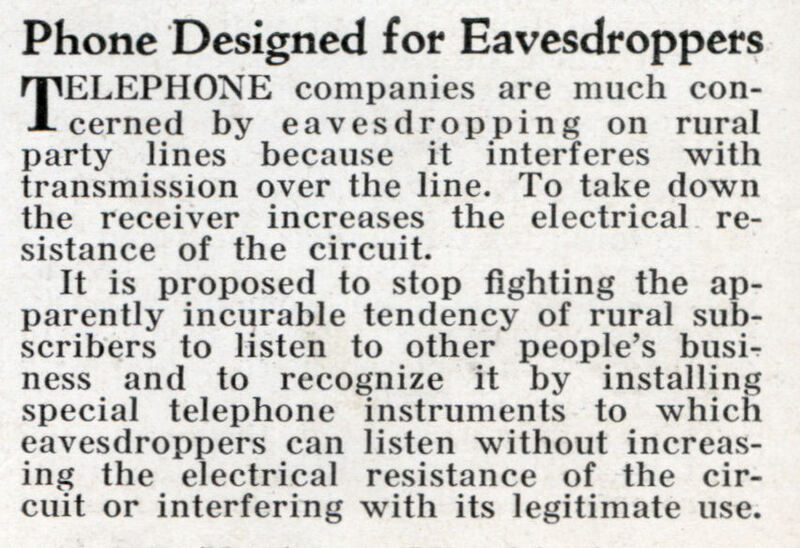 It is proposed to stop fighting the apparently incurable tendency of rural subscribers to listen to other people’s business and to recognize it by installing special telephone instruments to which eavesdroppers can listen without increasing the electrical resistance of the circuit or interfering with its legitimate use. Actually, I don’t think people “tapped” in quite like that. Party lines were for use in farming areas back when the phone companies didn’t feel it was worth spending the money to get phone service to so few people spread so far out. So instead of running individual lines to all those farms, they’d run one big line that everyone used. They setup ring tones, essentially, so that you would know the incoming call on the line was for you (often it was a pattern of rings, sort of like morse code). The problem was, with everyone using the same phone line, if the phone rang for someone else along the line, you could still pick up and listen to their conversation. Which I think is what they’re referring to here. 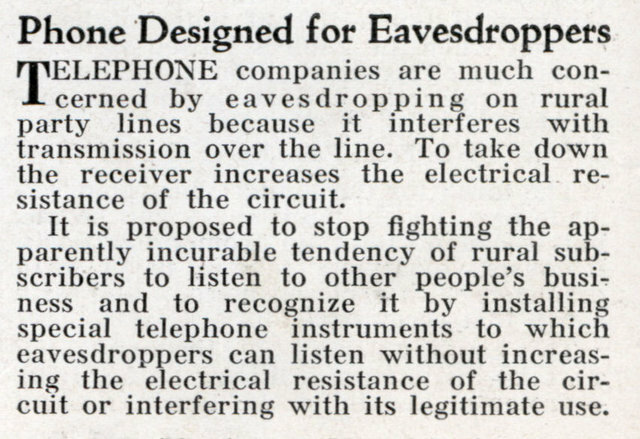 Basically these “eavesdroppers” were probably old farm wives who wanted to hear the latest gossip to spread around the quilting bee. Space: I think you’re right. So what do you think they’re doing? Just adding a power supply to recievers?